Maybe it’s because M. R. Zapp has been Tweeting Indian food at me. Maybe it’s this sultry weather that’s finally made it to East Cornfield, PA. Whatever it is, I have Indian food on the mind, and nothing fits the Meatless Friday bill like a quick, simple curry. If you know your kitchen well enough, you should be able to get this dinner on the table in 30 minutes. It’s great for those sultry summer evenings, because most of the cooking is done in the microwave. I’ll start with the Suddenly Naan, because the main dish is prepared during the dough’s resting time. Combine dry ingredients and seasonings in a mixer bowl. In a separate bowl, combine milk, yogurt, oil and egg. Using dough hook, mix wet ingredients into dry and keep mixing until dough pulls away from sides of bowl. With floured hands, form dough into four equal balls and let rest, covered, for 10 minutes at least, but 60 minutes max. After resting time, heat a heavy skillet with lid over medium-high heat. On a well-floured surface with a well-floured rolling pin, roll out each dough ball as thin as you can get it. Pour a splash of oil into the skillet. Place one dough disc in heated, oiled skillet and COVER IMMEDIATELY. Cook for 2-4 minutes per side, covering during cooking. Repeat with remaining discs. Keep warm and covered with a cloth until ready to serve. That, my friends, is a silicone band bracelet around the one cup mark on a measuring cup. 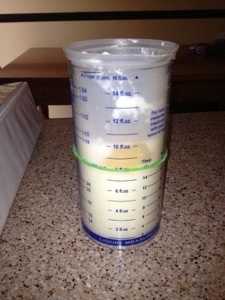 First I poured in 1/2 c milk, then I told my toddler to add scoops of yogurt until it all reached the green band. Then we added the egg, oil, and mixed it together. Just an idea on how even someone who can’t read yet can help in the kitchen. Combine all ingredients except rice in a microwave-safe bowl with cover. Microwave, covered, on high power for 10-12 minutes or until vegetables have reached desired tenderness (I tend to like mine still a little crisp). Stir in rice. This is particularly good with a dollop of plain yogurt. *Feel free to substitute any other vegetables: I’d like to try zucchini, yellow squash, white potatoes, sweet potatoes, etc.